At any time after Year 7 (assuming the above schedule), the referee may be considered for National nomination. This requires an invitation by the Provincial FA (cannot simply apply) and is often the most difficult obstacle. From here, a referee must choose whether they want to continue down the referee path or the assistant referee pathway for the rest of the way. 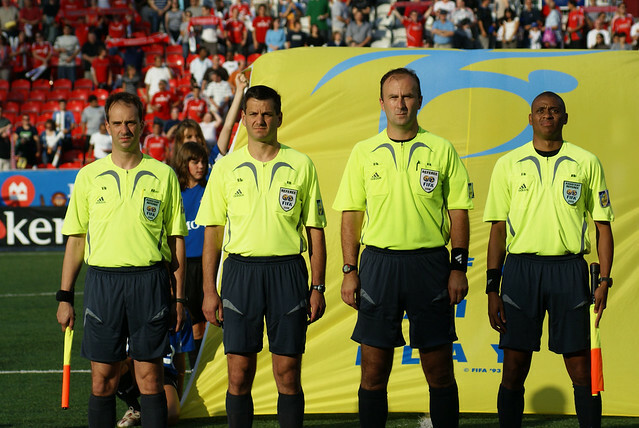 Nomination and a successful season is only one step in becoming a National match official. The second part requires the referee to attend the U18 Club National Championships (by invitation) in October/November and perform above Provincial level competency to receive their National badge. This is often followed up by a training camp, fitness test and Laws of the Game written test before the badge is officially presented. It often takes at least a few years after becoming a National official to receive a FIFA nomination and become an international referee. Even once that classification level is attained, there are different categories under each confederation (CONCACAF, UEFA, AFC…) to be considered for continental competition such as Champions League. The categories are often named: Elite, First, Second & Third. There are several upgrading programs in-place. The Regional and Provincial Upgrading Programs accept applications from referees each year with pre-requisites that must be met. They are one year programs and the decision for upgrading is made at the end of the year. Upgrading involves commitment and sacrifice. Receiving nominations, on the other hand, are performance-based from observation of the Provincial/National FA (OSA/CSA) and FIFA. The Advanced Referee Training program is limited in space for the top 20 Provincial referees in the province and a referee must be in the program or a graduate of it (3 years) in order to receive a National nomination. The various levels for District Referees are more fine-grained and described in the OSA Referee Grading Protocol document. Throughout the process, there are fitness testing, Laws of the Game and on-field assessment requirements to pass with increasing rigour. To go from no certification to FIFA would take at least 10 years, and it quite often takes more. Referees are normally in their late 20s when nominated by the province to the National List and then in their mid 30s when nominated to the FIFA list. There is definitely a time in my referee career where you go from “refereeing to stay fit” to “staying fit to referee”. This transition will require referees to take less games, to ensure they have time to train and, importantly, to recover. Striking the right balance between games, training and recovery will help avoid injury, staying physically and mentally alert and fit and ensure continuous improvements on the field. At this time in my career, I train 5-7 times a week, but I would say I am on the high-end of training time because I am also a competitive runner in addition to a FIFA referee. In addition to the quantity of training, I firmly believe that quality of the training sessions are crucial to get results. Below is a typical week for me during the soccer season. As mentioned earlier, I officiate less matches now than I did when I was a district or a regional referee. The quality is more important than the quantity. Also, the traveling time to matches increases as you move up the refereeing ladder, so it’s important to balance time devoted to soccer to time devoted to the rest of your life, such as family, friends, leisure time, etc. Typically, I will do 1 middle in League 1 or higher leagues a week and then I may take either a 4th official or a local game on a weeknight. It’s very rare for me to have more than 2 middles in any given week. I think it is primordial for me to manage my schedule very well, so that I am physically and mentally alert for every single game. For me, refereeing is all about compromises. Obviously, I have missed several social events due to my soccer obligations and my friends and family are weirdly accustomed to the phrase: “I can’t, I have a soccer game”. However, I find refereeing gives me several opportunities that I wouldn’t have had otherwise. First, it helps me build skills that are useful in everyday life: conflict management, concentration, self-confidence, decision-making, organization, respect and professionalism, etc. As a teenager seeking a job, you can use this experience to highlight some of the strengths you have. Second, refereeing has expanded my social circle tremendously. I consider a lot of my regular teammates and fellow officials as close friends and I certainly wouldn’t enjoy refereeing so much without the camaraderie of the referee world. That’s true at the local level and also at the international level. Since I started traveling abroad for matches, it is incredible to meet referees from all over the world and share a passion with them and learn about their culture and beliefs. Finally, refereeing provides me with a challenge and adrenaline on a daily basis. It keeps my life interesting and that keeps the passion burning for me. My weekly training depends on game day. For a Saturday night match, let’s go back to the prior Monday. Monday: start with a light run (3-5 km) followed up by some weight-lifting; altogether close to 2hr. Wednesday: easy run for a few km and very good stretching. Thursday: back to a busy day, start with heavy sprints, and long high intensity run, and some weight lifting but not too much. Friday (day before the match): in the morning, a good warm up, and maybe for 15min some sprints and very light run after for 10min. And it is travel day to the match for the remainder. Sunday: Depending on the time of the flight, do the recovery run, and travel back home. Training, as you can see, is 7 days a week. After I receive the appointment 3-4 weeks in advance, I try to look and learn everything about the teams. The games they played before, study the players – watch different games on TV, try to learn something from every game and watch the referees. I spend lots of time talking with the crew before I arrive at the stadium. Time; lots and lots of hours dedicated to soccer. Has refereeing impacted my life? FOR SURE, it has changed my life. First, to be more healthy, try to stay fit and to have a healthy body which is a big part of a referee’s life especially when you get older. Second, it’s made a huge impact in my life. I learn how to communicate with players, coaches…communicate with co-workers. Build skills that you need on a day-to-day basis, build self-confidence, decision-making in a very short time (especially on the field of play), to be more organised, build respect for others, and also to be professional in what you are doing. Last but not least, to be a very good friend with my fellow Referees, be a good person and father. Training is an important aspect of my refereeing career. For the first many years of my career I relied on training as a player to keep fit. Since my playing career wrapped up 4 years ago to pursue refereeing I typically train 3 – 4 times a week depending on how many matches I am involved in. Assuming an important match on the following weekend. I will do high intensity training (alternate between a stationary bike or interval running) on the Monday. Strength/weight training Tuesday and/or Wednesday; Speed, agility on Thursday; Rest/Stretch, easy cardio on a Friday. Work a match on a Saturday. This often varies due to a mid week appointment. Due to the rigorous demands for fitness at the provincial level it is critical to not overschedule myself with games in order to adequately allow the proper physical and mental rest. The physical and mental demands are met with a demand for time. A typical match at the top levels in the province involve the following: Travel 60-90 minutes ( to Toronto, plus traffic, which is common ), 90 minute arrival time before the match, 2 hours for the match, 30 minutes for paperwork and a shower, 30 minutes for a possible assessment, 60-90 minutes to drive back home. This ends up being 8 hours for most matches. I think you can start to see that doing multiple matches in a week (while holding down a full time job) is not easy to do. Lets take a step back and look at what goes into doing a high level game. Preparation starts well before game day, so all of your training should account for time toward each match. The pregame discussions regarding tactics and players to be aware of also take hold your mental energies and thus time. Other preparation such as studying of the laws and watching other matches also eats up time in preparation for a match. How has refereeing impacted my life? Well the first and most obvious to me is that it made me make a choice between playing and refereeing. It certainly wasn’t an easy one for me but I think I have made the right one. The friends and colleagues I have made through the many hours on the field, training, or travelling along the 401 to matches make the journey that much more enjoyable. The spending of summer weekends at and around the soccer pitch is something that I love to do and refereeing will keep me as close as I can get to the field for the longest period of time. I started the refereeing journey at 15 as a summer job, I love the feeling of making the right decisions and providing a great playing experience for the players on my field, and allowing those spectating to forget I was even there. I try to train 5 times a week. In the off-season, it typically consists of a typical 10km race training program with a weekly long run, a tempo run, an interval run and a couple of recovery type runs. I try to add in some Pilates and other core work but I struggle to keep that routine up during my lunchtime workouts. During the season, I limit myself to 1-2 games, mainly due to work and family commitments, but my body also appreciates the limit. In between games, I try to get in at least 3 other work outs in the form of recovery runs and interval workouts. This year, I have started to race 10km as an added test of my fitness. As I mentioned earlier, I try to limit myself to 1-2 matches per week because my time is limited with work and family commitments. I try to limit the amount of travelling to about once per month or less. If I had more time available, I would probably choose to travel more and keep the number of matches at 1-2 per week. For me this a good balance of being able to give 100% at every match while also staying sharp enough to perform at my current level. I have refereed for over 25 years as I started when I was 12 in the house league in Cobourg, ON. For several years, it was a great way to spend time with my dad as he was also starting out as a referee and we would work games together, typically he in the middle and me on the line. When we lived in Cobourg, we would often travel up to Peterborough where my dad would do a middle and I would do what is now an AR2 (junior linesmen back then). In the last few years as I have obtained Provincial standing, I have made many good friends across the province through the ART (1 year) and working the higher leagues. I have also had the chance to work with various people across Canada when I attended 3 National tournaments. When I took 2013 off due to personal circumstances, the thing I missed the most was the friendships and camaraderie from the various road trips and games. The time spent with those friends will be memories I will cherish forever. I train 1-2 hours per week during the season and 3-4 hours/week during the off-season. I spend 2-3 hours per week watching other referees, mentoring and online training sessions reviewing education. I work about 3-5 games/week. Games vary around the region but I travel for bigger appointments further away such as Ontario Summer Games and Ontario Cup. Most of my evenings are taken up by refereeing so it has a big impact on my life. It’s one of those things that I am more involved in during the summer and depending on other things going on in my life. Well retirement has brought the benefit of not needing to train as frequently as I use too. Training is strictly for personal reasons now and not for match readiness. I usually visit the gym at work at least 2-4 times per week when working. I utilize my 90 minute lunch to work out. A work out consists of 30 minutes on the elliptical and then some stretches and short circuit of weight training. This keeps me fit enough to do the matches which come my way these days. As far as match preparation goes these days there really isn’t any as none of matches really cause me much issue. Refereeing has afforded me the opportunity to have travelled and officiated in matches above my ability as a player. I have met and worked with some wonderful people over the years, all of which have impacted me in a positive way as a person. I hope that as time goes by I am able to help or at least influence others in their development in the greatest sport in the world. Some things were promised and not followed up on. Other things have been taken away due to my work schedule conflicting with recertification clinics. But that is life and we must move forward with these small disappointments. My best advise to anyone involved in refereeing is to remain calm under pressure, be brave in your decision making and work hard at developing your craft. Enjoy each game as it might be your last and don’t forget to help in the development of your fellow officials. During the season I try to take 2 days off a week so depending on game appointments this will determine training time which is usually 1-2 hours each workout. Non games days may be split between, running including speed work, and weight training, to mix things up sometimes speed work on a bike. The off season is peak training time, 2 hours 5 days a week, which is broken up with distance and speed running. Weight training is a big component of the off-season as it helps reduce injuries. Each game day has a routine that includes eating 3 hours prior to game time. Refereeing bag is generally packed the night before as well as field location researched so that time may be allotted for traffic. Depending on the location of the field and arriving early depending on time required, match days could have 5 or more hours dedicated to matches. Refereeing has made a hugely positive impact on my life. Learning how to interact with players, coaches, referees and assessors has created the opportunity to communicate well with co workers in the work force. Health and fitness is a big part of being a referee and that results in a healthy body. Meeting and working with referees all across Canada has built many great friendships over the years. It has provided me with the opportunity to mentor referees and pass on tips and suggestions that were given to me over the years to help referees develop their games. The referee code of conduct is a great code to add to social and work life. I never put too much emphasis into training as a District referee. A long time ago when I was playing soccer competitively, I used to train on a daily basis. Since I became a referee 7 years ago, I maintained my fitness through a variety of sports activities (basketball, gym and swimming) during the off-season and during the summer, refereeing 3 times a week keeps my fitness level to acceptable levels of the games I’m assigned to. I always maintain my fitness level relatively high because I know if my fitness level during a game is very low it affects my awareness and my overall referee performance. Healthy combination of good nutrition and good fitness is my number one preparation for each soccer match I ref. As referees we all have bad performances on the pitch but I don’t allow these basic things to negatively impact my performance. Refereeing has impacted my life tremendously. As a player you look at a game you play only from a one-sided perspective but becoming a referee, you learn there is so much more to the game than just trying to win no matter what. Maintaining my composure while dealing with so many different individuals (personalities) who always try to get under your skin and influence your decisions has taught me so much about self-discipline that can be applied in so many aspects of my life. I don’t really need to train for the games at my level. I guess the main method to train for me is by practicing and doing more games and also by asking more experienced referees questions. I do about 5 games a week. I dedicate 4 of my evenings each week to reffing games and also weekends when there is a tournament. I also play so sometimes I don’t get a break all week! It’s impacted my life because it’s made me a more confident person since I always have to have confidence when I go to ref. It’s also improved my decision-making because I have to make quick decisions all the time. It has also impacted my life because I’ve met a lot of great people through reffing who have given me a lot of advice. Next postWhat’s in your referee bag?